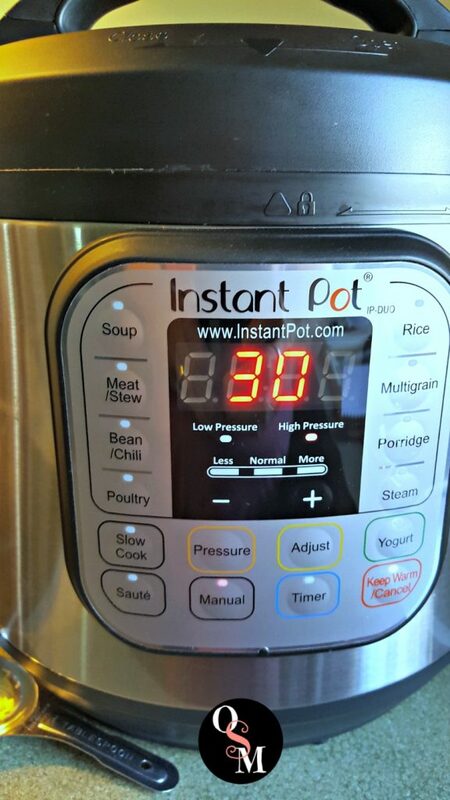 You’ve got an Instant Pot, now what? I remember feeling like that when I first got mine, too. So excited to finally have this amazing kitchen tool! No clue how to use it. Maybe a little afraid. Because PRESSURE, folks. That stuff can be dangerous. That little pressure cooker is going to make you look amazing. Seriously. One thing I love about my IP is how it saves my bacon several times a week while making me look like I’ve got my stuff together all the time. I mean, when hubby gets home to a tasty, home-cooked meal it sure looks like I’ve brought my A-game to the day. Confession: sometimes I forget to thaw the chicken I wisely stocked my freezer with a few months ago. And I realize it like an hour before I should have supper ready. My IP saves me every time. Just pop that frozen-solid chicken in the IP, add a cup of water or broth and any seasonings you like, set to Poultry or Manual for 25-35 minutes (depending on how much chicken is in there – refer to the handy cooking time charts from Instant Pot here), make sure the vent is sealed, and forget about it while you whip up a side dish and salad. For this recipe, I set my IP on Poultry for 30 minutes. You do have to account for time to build up pressure and release pressure, but I’m telling you – going from frozen solid chicken breast to shreddable in less than an hour is fantastic! 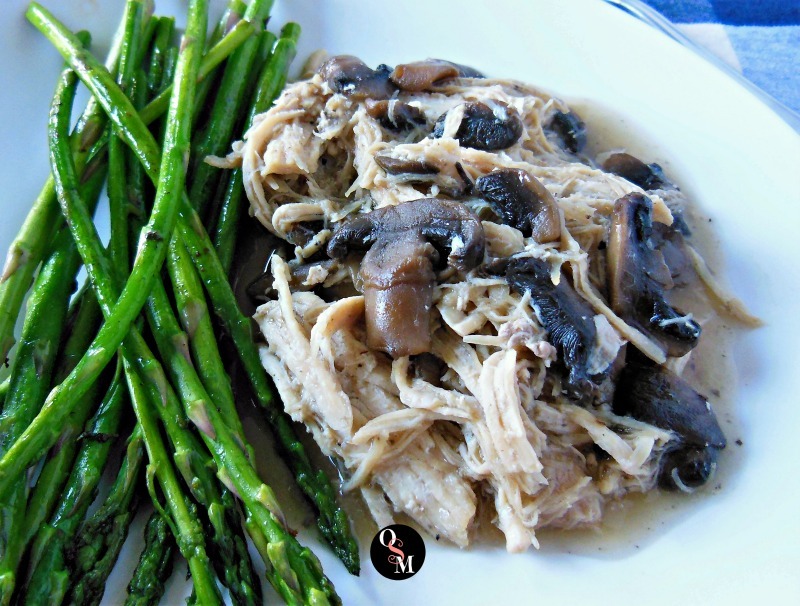 This Mushroom Bay Chicken for the Instant Pot is a delicious, easy, THM friendly protein source. 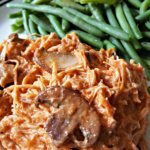 You can make this tasty Mushroom Bay Chicken for the Instant Pot to fit any Trim Healthy Mama fuel style. Want some Satisfying S? Use a liberal (but reasonable) amount of healthy fats such as coconut oil, red palm oil, butter, or ghee for sauteeing the mushrooms, onion, and garlic. Unrefined coconut oil may impart a coconut flavor, so if you don’t like that choose refined coconut oil instead. Serve with your favorite, on-plan, low-carb pasta or pasta substitute and a healthy veggie or salad on the side. Need some Energizing E? Use 1 or 2 teaspoons of healthy fats, or use cooking spray for sauteing – especially if you’d like some fat elsewhere in your meal. Serve with a healthy carb source such as baked sweet potato, brown rice, or quinoa, and a healthy serving of veggies. Just keep the total fat grams to 5 for the whole meal. Ready for a neutral Fuel Pull? Keep the healthy fats low, just like for an E meal. I’d recommend using the cooking spray instead of adding fat to this. Then limit serving size to just slightly over 3 ounces since you’ll have liquid and some veggies included. Load up on non-starchy veggies such as steamed asparagus or green beans and an assortment of fresh veggies such as pepper strips, cucumbers, celery, broccoli, and cauliflower. You could save your 5 grams of fat as a teaspoon of butter for your steamed veggies, or in an on-plan dip for your fresh veggies. 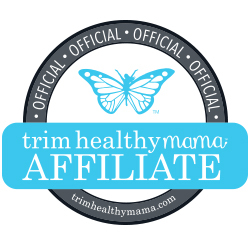 Curious about Trim Healthy Mama? 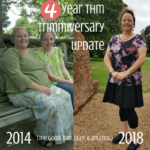 Here’s 5 Reasons THM Might Be For You! 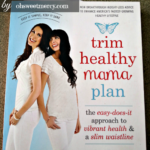 Ready to order the Plan book? My affiliate partner can help you! From frozen chicken to delicious in no time makes you look amazing, right? 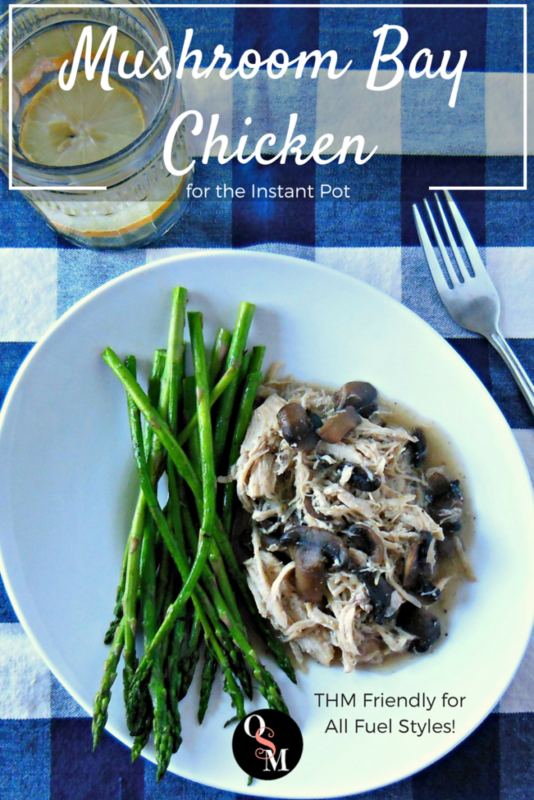 In just a few minutes you can have this tasty Mushroom Bay Chicken going in your Instant Pot and then do something else while the magic happens. Make a salad. Prep some asparagus to steam. Sip on some soothing, relaxing, herbal tea and reflect on how you’ve got it together today. Even if it’s just this one thing. It counts! You can also make this in your slow cooker, just throw all that stuff in there (I’d reduce the liquid to just a quarter to half a cup though unless you want soup) and turn it on. Then wait for hours. Your choice! I do realize that these things cost money, and sometimes you just don’t have it. I didn’t for a long time, then got lucky and caught a great sale. By all means, use your slow cooker if that’s what you have, it’s really a tasty dish! But if you can get an Instant Pot, I highly recommend it! 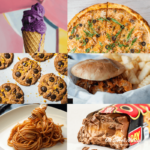 Check out Working At Homeschool’s round up of THM Instant Pot recipes for more inspiration, too! Let’s make some Mushroom Bay Chicken! 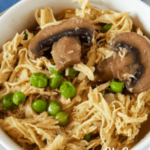 This easy, delicious, Mushroom Bay Chicken for the Instant Pot is quick to put together and in no time flat you'll have a healthy main dish that's a perfect THM protein source. Suitable for any fuel style! Set Instant Pot to Saute, adjust to "Normal"
Secure lid on Instant Pot, making sure vent is set to "sealing"
Select Poultry or Manual setting and adjust time to suit amount of chicken in the pot. Add another 5 or 10 minutes for frozen chicken. See this chart for cooking times. Increasing the amount of frozen chicken will increase the amount of time for the IP to pressurize. Please refer to your IP manual or the cooking time charts here and add 5-10 minutes for frozen chicken. Cooking time is separate from time needed to build and release pressure. Do not fill your Instant Pot more than ⅔ full. QPR - some people find using the Quick Pressure Release on cooked meats dry them out. Use Natural Pressure Release if you have time. For an S meal, use a liberal but reasonable amount of healthy fats. Serve with healthy low carb options such as zoodles, cauli rice, or other on-plan options, and plenty of non starchy veggies. For an E meal, use 1 to 2 teaspoons of healthy fats OR use cooking spray - be mindful of the rest of the fat in your meal. Serve with a healthy, on plan carb option such as baked sweet potato, brown rice, quinoa, etc, and plenty of on plan veggies. For a FP meal, use cooking spray (or E guidelines) - be mindful of the rest of the fat in your meal. Serve with on-plan low carb options and plenty of non starchy veggies. 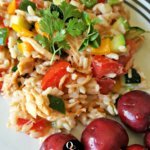 You’ll want to PIN this to your favorite THM and Instant Pot boards and share with your friends! I sure appreciate it! OHMYGOSH!!!!!!! That looks fantastic (and I don’t even like Asparagus)! This is great! I’m compiling as many recipes as I can for the day that I get my own instant pot. Oh my goodness, yes! Good catch Rebekah, and thanks so much for bringing that to my attention! I’ll fix that right away.